On March 9, 2013 we published an article on a ground breaking swallowing treatment initiative to infuse adult stem cells into a human tongue by Christmas day 2014. [Click here to view that article]. 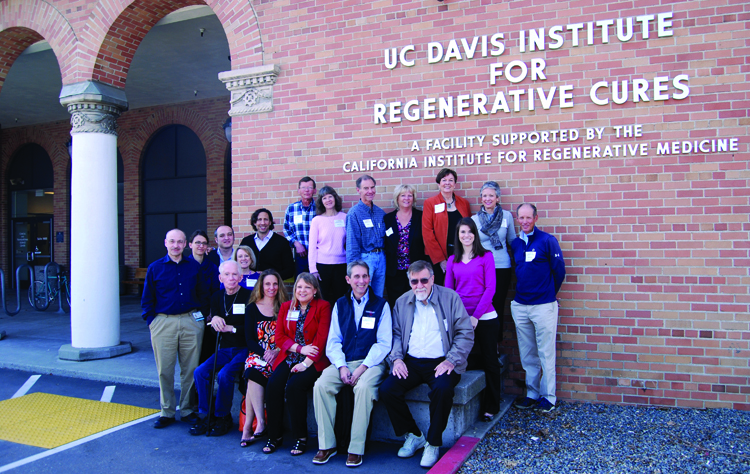 Two days later, on March 11, 2013, we received an “A List” tour of the UC Davis Institute for Regenerative Cures (IRC). The NFOSD would like to thank our hosts Dr. Peter Belafsky (Phase I trial Principal Investigator), Dr. Jan Nolta (IRC director), Gerhard Bauer (Director of Good Manufacturing Practices), and Jane McClusky (tour facilitator extraordinaire). Pictured above, tour participants included researchers, clinicians, dysphagia sufferers (including caregivers and family members), and even a few visiting physicians from Turkey (in no particular order): Sonia Blue (NFOSD Past President), Mike Donovan (NFOSD Board Member), Pat (Patricia) Jelley, Bill and Karen Baird, Norm and Jeanette Yetka, Jack and Karen Eadon, Bill and Kathy Souza, Ed Steger (NFOSD President), Dr. Peter Belafsky, Dr. Jan Nolta, Gerhard Bauer, Charlie Casey (UC Davis Communication – not pictured, he took this photo), and three visiting physicians / clinicians from Turkey. The tour began with an incredible presentation by Dr. Nolta on the history of the facility and the current work being conducted. She presented the science of adult human stem cell growth, past and current human stem cell projects conducted at the UC Davis IRC lab, the FDA approval process, the lab layout, and an actual time-lapse video of stem cells regenerating under a high power microscope. Following Dr. Nolta’s presentation, our group of 19 toured the entire facility. 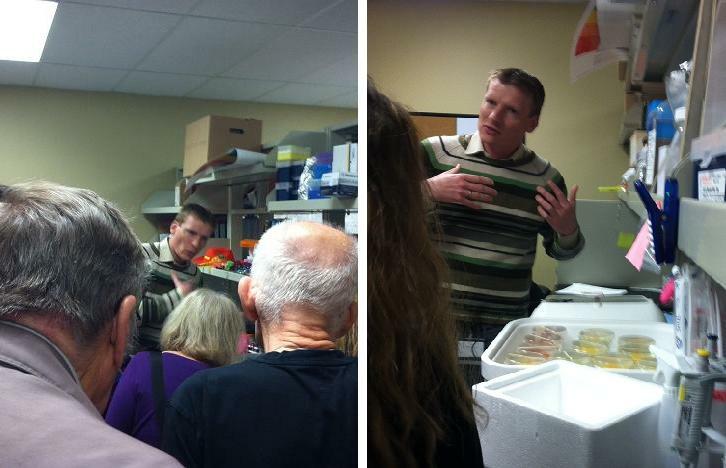 We witnessed researchers nurturing cell cultures (see pictures below), cell incubation equipment, high powered microscopes, and time lapse photo equipment. We were then lead to an observation area for the four (or five) clean rooms. These are right out of a science fiction movie (think, The Matrix). The air flow and room pressurization is meticulously controlled to eliminate cell contamination. Full hazmat-type suits are worn in these restricted areas and moving from one room to the next may require a shower. Each room had its own purpose and additional measures of sterilization. After the tour, the dysphagia sufferers, caregivers, and family members met for a post tour wrap up session. 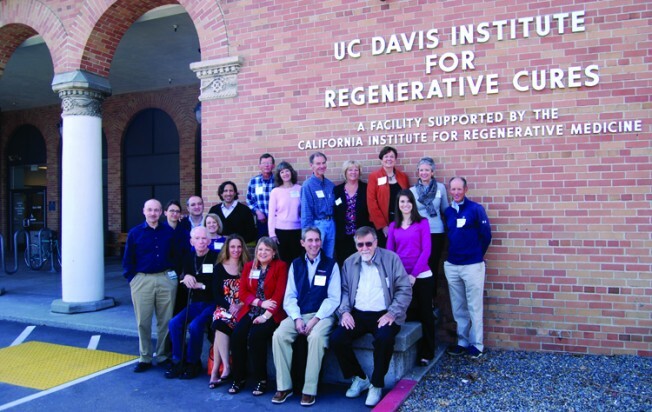 The tour left no doubt in the participant’s minds as to the care and precautions undertaken by the IRC researchers and processes in preparing adult human stem cells for infusion. Plus, there was palpable excitement in the room and it gave each and every participant HOPE! A recap of this phase I human tongue cell trial includes, in priority order: safety, viability, and swallowing efficacy. The hypothesis being tested is… by adding muscle cells to the tongue (via an adult stem cell infusion), will this enhance one’s ability to swallow. Prior and current research believes this to be the case. The meeting ended with a discussion of how best to fund this effort. In the scheme of FDA approved human trials, the cost for this initiative is modest at $40K. Most of this funding will be used to purchase the reagents (drugs) required to cultivate the stem cells. Meeting participants and a few others (brought together by Dr. Belafsky) exposed to this initiative stepped forward and provided directed donations to this initiative via the National Foundation of Swallowing Disorders (NFOSD) of approximately $20K. Another $10K in directed donations has been pledged over the next 12 months. Dr. Peter Belafsky, the study’s Principal Investigator, and the NFOSD thank each and every donor for their generosity. If you would like to help reach the full funding goal for this effort, please email us at info@nfosd.com. Additional funding is required to conduct this trial. Note, the above article references this work as a phase I FDA trial. To be clear, the plan for this initiative is to become a phase I FDA approved trial during 2013. The information shared here is intended as a brief glance into the exciting world of future potential swallowing therapies.